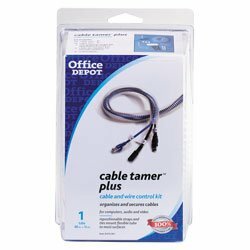 Eliminate cable and wire clutter from computer workstations and telephone equipment. Includes cable ties in two sizes, mounts, Velcro(R) selfgripping straps, coded labels, and a 40inch tube to neatly contain all sorts of cables. If you have any questions about this product by Office Depot, Inc., contact us by completing and submitting the form below. If you are looking for a specif part number, please include it with your message.